Nice idea, not sure how to do it. Will be watching. I just saw that Bonnie Hunter posting also! I was out googling for busy bags but all that comes up is for little kids. I am curious to see what others post here. The "Bonnie" ones are eye-catching. They interested me also. Send Bonnie Hunter a note on her facebook page or on her blog. She seems to be really good about responding directly to a question. I have a few Yazzii bags, which are half off right now at www.Joann.com. I have the large organizer with pages and the supreme organizer. 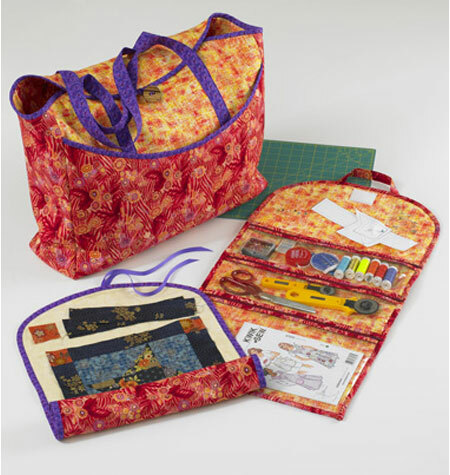 The large organizer is fairly small and is great for carrying handwork; the supreme organizer is great for bringing all your supplies to a class or retreat. I also just purchased a pattern for an organizer but I haven't had time to make it yet. It's this one: http://www.byannie.com/shop/product/hold-everything/ but she's got a number of patterns that are great for this sort of thing. I searched her blog and found where she bought hers at a knit shop while traveling. I would think almost any bag with zippered pockets that isn't huge would work. I may have to go on a busy bag hunt for myself. Teeheehee. That Bonnie Hunter is such an enabler. I now have a two treadles because of her. LOL Oh, and an Ikea clip on lamp also. That was much cheaper than the treadles though. They looked like small jewelry or cosmetic bags to me. Lotta good links on here, thanks! to see all the bags go here: http://www.yazzii.com/ I have several made bags given to me but the plastic tore out of the seams or ripped and the seam threads broke in places. If you make one be sure and use quality clear vinyl and upholstery thread. Here's an EASY PEASY idea. You can use potholders or placemats. Sorry no pictures! 1. Take your regular baggies (either sandwich size for the potholder, or gallon size for the placemat) and stagger then slightly so that the "zip" part lay under each other. I suggest 4-5 per "side". 2. Lay half of the baggies to the left side of the potholder/placemat and half on the right side. 3. Place a length of fabric down the middle of the baggies (also the middle of the potholder/placemat. Stitch both sides of fabric strip down all around. Trim excess baggie bottoms that stick out. 4. Fold in half and sew a button on one side with a loop on the other side to hold closed. I have on made from a potholder and I carry it with me to all quilt classes as I have all my little essentials with me at all times. Here is a link that explains what maxme01 was explaining about the pot holder and baggies, while I love the look of other busy bags I have seen, I could easily make this one tonight and it would work well. Thanks for the reminder that I had saved this link to Pinterest. I got one of these as a gift, and every time I use it, everyone wants to know where I got it. Very handy! Love this one!! Going to get the pattern tomorrow! great travel bag for anyone! Oh, thanks for sharing this!! I think I might have to get this! I you are using the plastic bags to make one, be sure it is the heavy freezer bags. Regular sandwich bags will not hold up. I like that Kwik sew pattern very sharp. I bought a cosmetic bag yesterday at Meijer (large chain grocery store). It was a perfect size and had zippers. I have jury duty this Thursday so I am going to see if I can get through security with it. I also bought a pair of blunt tipped scissors (nose scissors) that Bonnie travels with. I love this board.